Simply put, the Lasso development platform is the easiest, quickest and most secure method of supporting custom, data-driven web sites on the market today! Lasso bridges the gap between popular web servers (Apache, IIS, or any FastCGI-compliant server), data sources (MySQL, FileMaker, Microsoft SQL Server, Oracle, PostgreSQL, Openbase, and more), and various other communication tools, utilities, and protocols such as email (POP, SMTP), directory services (LDAP, Active Directory), web services (SOAP, XMLRPC), and PDF generation. 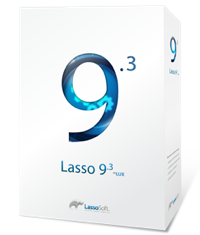 Lasso is available for MacOS X, Windows, and Linux operating systems. Lasso embraces open standards making it easy to work with a wide range of data sources, Web servers, and platforms. Web applications you develop on one platform can be deployed on another seamlessly. The Lasso suite of tools extended popular web development environments with Lasso-specific syntax coloring, code completion, error checking, and debugging capabilities. Lasso can be downloaded FREE and run with full functionality for local development and testing - it is limited to 5 ips and 200 connections while in the unlicensed developer / trial mode. The same version can then have a license applied and made live to remove the ip and connection limitations and bring the full power and speed of Lasso to your solutions. Tell me more about Lasso - what are the benefits? "Chose lasso for its simplicity. All the best!!!!"